Indicating gage, Low and High limit control, 4-20 mA transmitter. Next, two DPDT relays are added which serve as Low/High limit controls (or pressure switches) capable of handling up to 10 amps @ 28 VDC or 120/240 VAC directly. Individual setpoint deadband is one pointer width — less than 1% of full scale; just enough to assure positive, chatter-free operation. Integral holding coils enable user to connect the two so they work like a single control with variable deadband — ideal for applications such as clean room and building pressurization, HVAC systems, automatic air filter or level control and much more. Actuation points are fully adjustable over the entire pressure range with convenient front mounted knobs linked to bright red setpoint indicators. Finally, the Photohelic® SGT includes a separate 4-20 mA, 2-wire transmitter operating from an external 10-35 VDC power supply. Separate adjustments are included for zero and span inside the rear electronics enclosure. Optional A-700 Power Supply is a perfect companion rated for AC inputs from 100-240V; DC outputs from 24-28V. The transmitter component is an ideal driver for variable speed blowers and fans, damper positioners and for continuous data logging on computerized VAV systems or strip chart recorders. Besides the obvious cost and space saving advantages of combining all these control functions in a single unit, think of the additional savings in time and material with just one set of pneumatic lines to connect instead of three or four. Accuracy: See model chart on "Ordering" page. Pressure Limits: See model chart on "Ordering" page. Weight: 3 lb 14.5 oz (1.77 kg). Switch Type: Each set point has 2 Form C relays (DPDT). Electrical Rating: 10A @ 24 VDC or 120 VAC, 6A @ 240 VAC. Power Requirements: 120 VAC, ±10%. Thermal Effects: ±0.025% F.S./°F (0.045% F.S./°C). Power Requirements: 10.0 to 35 VDC (2-wire). Zero & Span Adjustments: Multi-turn potentiometers, internally accessible. Current Consumption: 38 mA DC, maximum. Differential pressure switches shall incorporated gages and switch setpoint indicators for continuous indication of applied pressure and switch settings. An integral 4-20 mA pressure transmitter shall be included, calibrated for the range of the pressure gage. Separate zero and span potentiometers shall be provided. Units shall be diaphragm operated with switching accomplished by phototransistor controlled DPDT relays. Setpoint adjustment shall be controlled by knobs on front of unit. 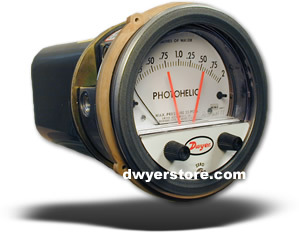 Switch/Gage/Transmitter shall be Dwyer Instruments, Inc., Photohelic® Catalog Number.___ reading to ___ (in. w.c.)(Pa)(kPa) in ___ minor divisions.